If there is one major thing that Matt and I have in common, it is this: we are huge animal people. We both adore animals and will always be the kind of family that has a pet. We both grew up with pets, and we want our children to experience the same thing. When Matt and I started dating, he had a dog named Bono (like the singer from U2. Some people pronounce it like Sonny Bono from Sonny and Cher. That's not it.) We still have him now, but he lives outside (long story). The summer after we got married, baby fever hit me hard. We had only been married a few months and were WAY too young to have kids, so we got a puppy instead. Enter Lola. For Lorelai's 3rd birthday, we got her a fish tank for her room. We took her to PetsMart and let her pick out her own fish. 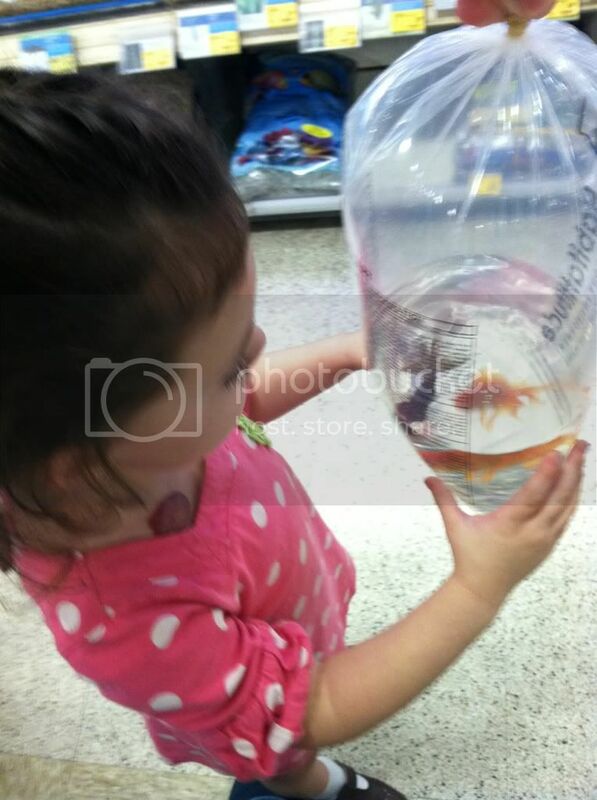 She got two goldfish (one gold and one black) and named them Marlin and Nemo. If there's something else that Matt and I have in common, it's that there's one animal that we do not care for: cats. We just are *not* cat people. At all. 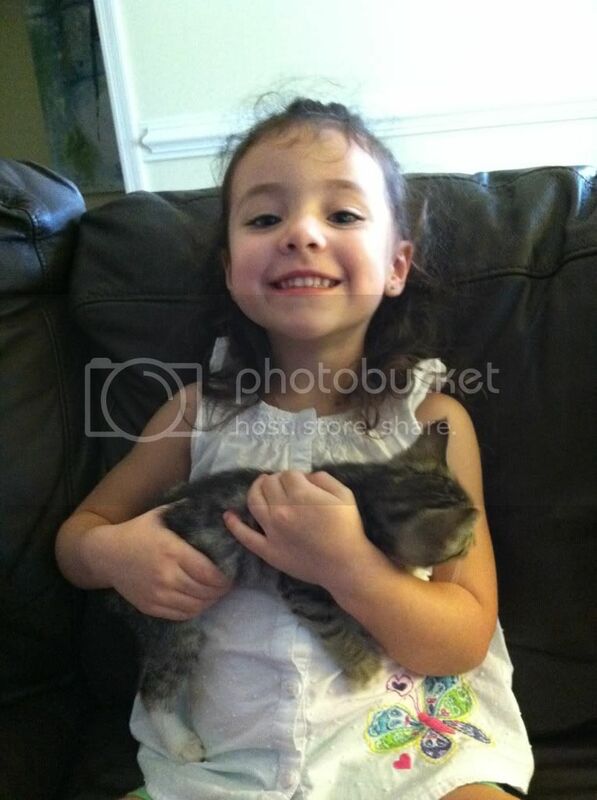 Forever ago, I took LL over to a friend's house for a play date, and they had a cat (Crissy!). LL fell in love with this thing and has on and off asked for a cat since then. We keep just telling her no, and usually she just moves on. One day, after LL went down for a nap, I was nursing Cooper in the living room. It was pretty quiet, and I noticed a noise that was NOT typical to our yard/house. Honestly, it was so small that it sounded like a bird. But the thing is, we have next to NO trees in our yard, so we don't hear birds a ton. And this sounded super close. Then, as I listened to it more, I realized that it sounded like a cat. After I got Cooper down for his nap, I went out on the porch to see if I could find the sound. Yep. I was right. 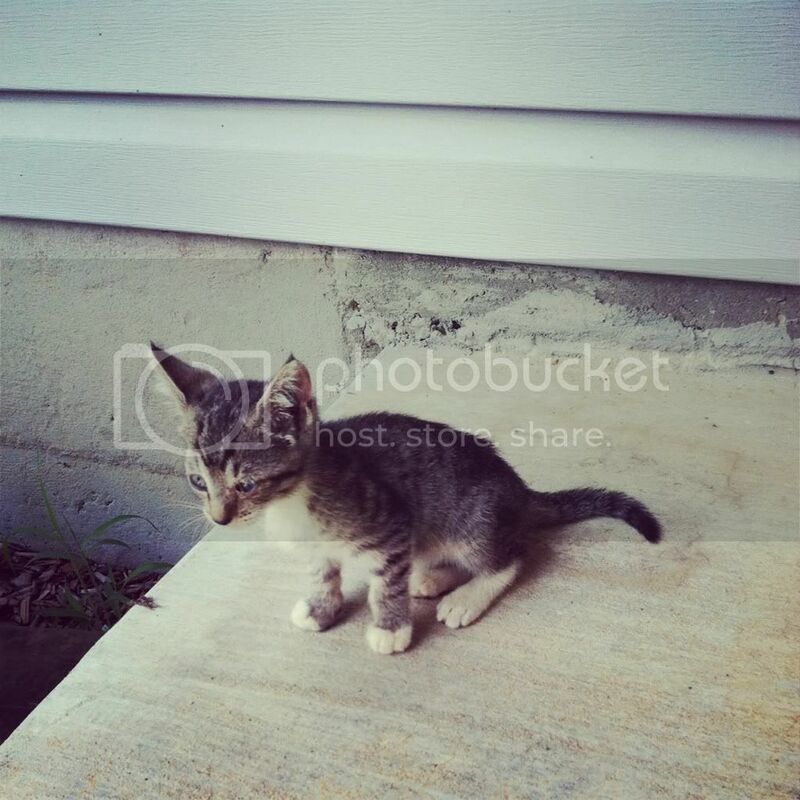 There was the smallest kitten EVER on our porch. I tried to take a picture of it to send to Matt, but it ran off the porch. Since I had both kids inside napping, I did not have time to chase this kitten. I went back inside, and after about an hour, I heard it again. 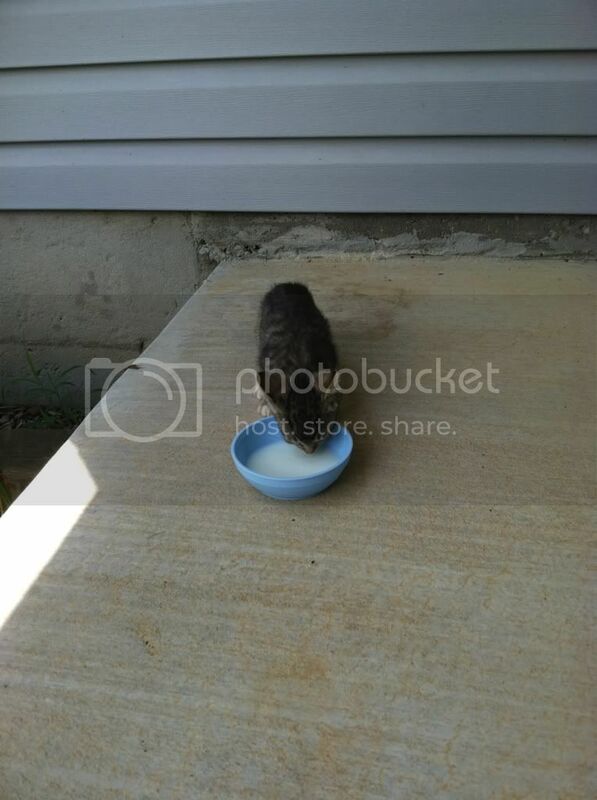 This time, I went outside and took it some milk (which Emily told me later is a BAD idea!). It came up and immediately started drinking. I kid you not - this was the smallest kitten I have ever seen. I felt so bad for it! After Emily told me that milk was bad for it, I took it some water. It was also acting SO hungry. Obviously we don't have any cat food, so I took it just a little bit of dog food. Close enough, right? It scarfed that junk down. I tried to call Matt in the middle of all of this, but he was busy at work and couldn't talk. I knew he was going to be SO MAD at me, but what was I supposed to do?! 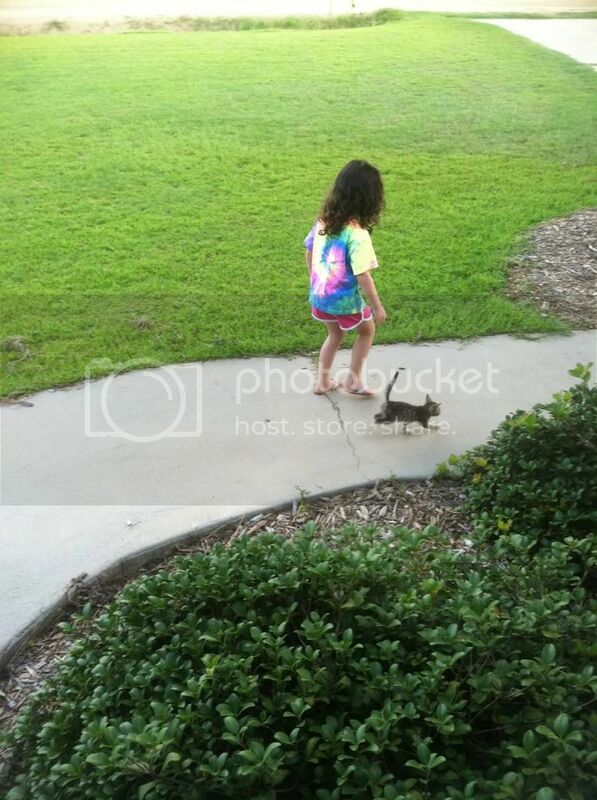 I'm a hormonal just-had-a-baby woman and this itty bitty kitten shows up at my house. 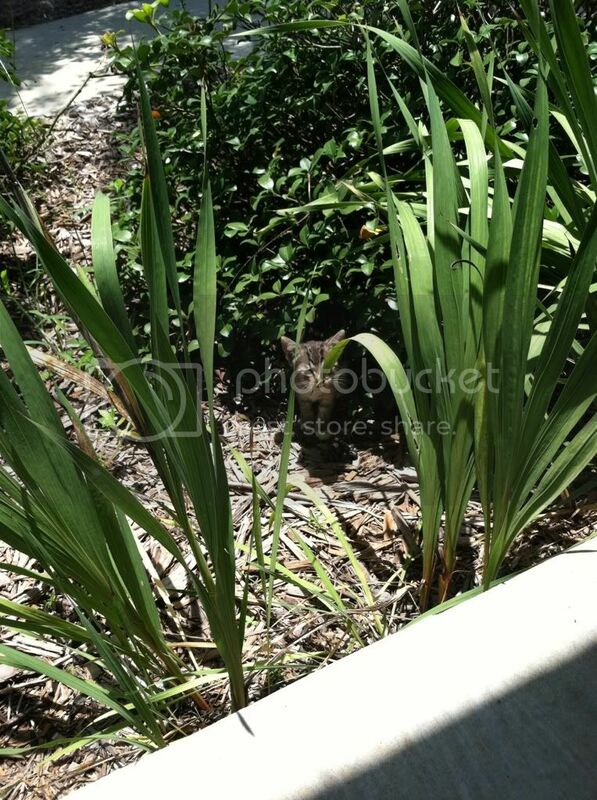 My momma-drive is already in high gear right now; there was no way I wasn't gonna help this cat. I'm always wanting to pick up stray dogs on the side of the road and he NEVER lets me. I just knew he wasn't going to be happy about this. But in my defense, this cat came to me. I did not go looking for it. Finally Matt was able to call me back and I told him what was going on. He could hear it meowing in the background and could tell it was small. He wasn't mad (shocker! I think he mostly acted that way because he was driving around with a co-worker - haha.) and said he would deal with it when he got home. My mom was supposed to come over that afternoon to get LL to take her to spend the night. She called towards the end of LL's nap to tell me that she was close. I told her about the kitten so that 1- she wouldn't run over it and 2 - she wouldn't be shocked to see it on the porch. When she got there, she was equally as shocked by how small it was. When LL got up from her nap, I debated on telling her if the cat was there. She was in a TERRIBLE mood, so I decided that I would just to cheer her up. 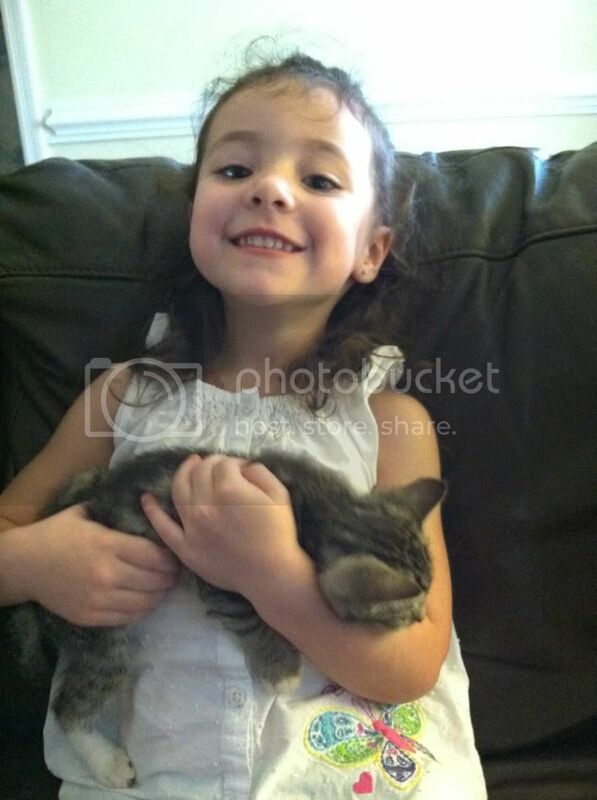 From the get go, I told her that the cat was NOT ours, and she seemed to really get it that it wouldn't be staying. 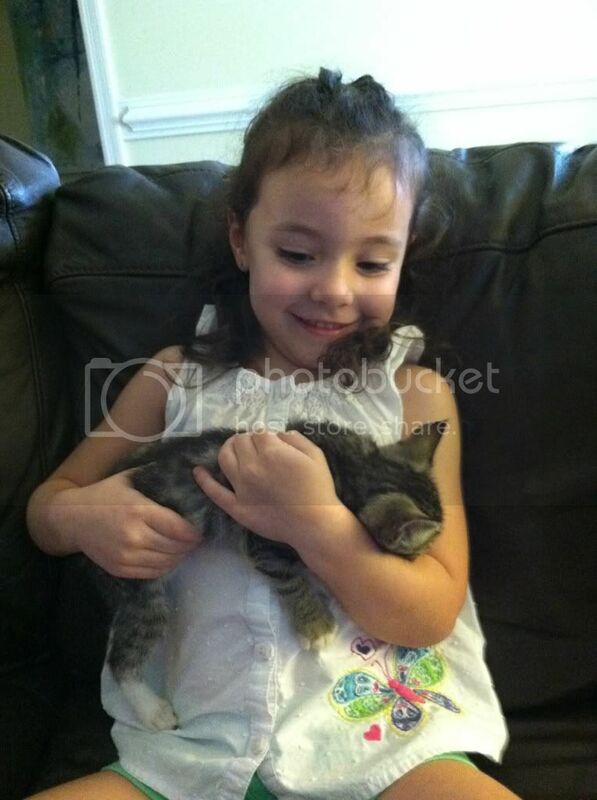 To say that she was happy to see this kitten is a huge understatement. When we were out on the porch with it, my mom said, "Uh-oh, a cat showed up! ", and I looked at her and said, "Yeah - Uh-oh is right!". That is when the cat got named Uh-oh. 1- Uh-oh is a boy. 2- The eye is nothing serious and has already cleared up. 3-He has worms and needs medicine. Yay. 4- He has ear mites and needs medicine. Double Yay. 5- He is about 8 weeks old. 6- He only weighs 1.25 lbs! I really wish I could have been there to see Matt tell them that the cat's name was Uh-oh. It really is hilarious to say. I also wish I could have been there when the vet called to tell him that "Uh-oh is ready to be picked up!". There are a few things we decided about Uh-oh. He WILL be an outside cat. We have enough going on without tackling another indoor pet (remember the two dogs, two fish, and two kids?!). We WILL get Uh-oh fixed. Even though he's a boy, we don't want to be responsible for a million cats running around. Uh-oh is free to come and go. While for LL's sake we hope he doesn't decide to leave, we're also not keeping him here. We will provide him with food and water, he is free to take it or leave it. But, obviously, he's taking it. I know - we're crazy. Please pray for us. 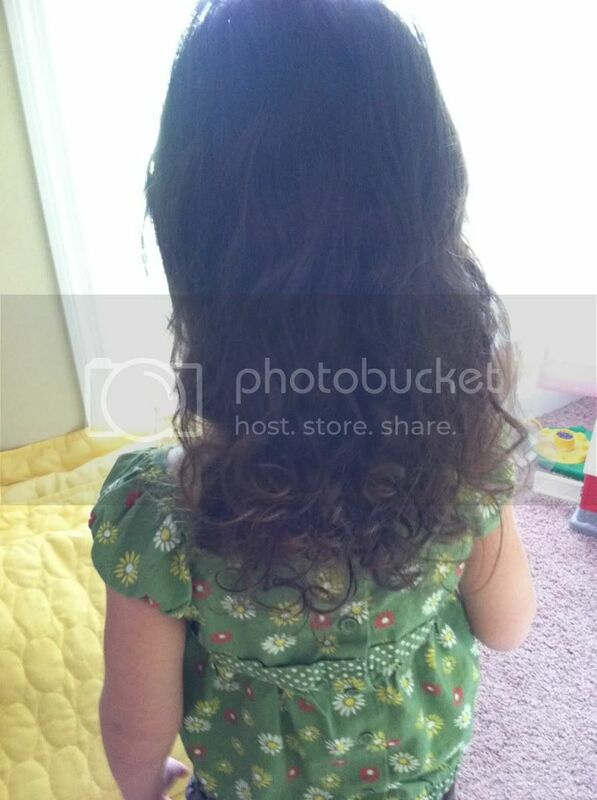 So far, we have never cut Lorelai's hair. 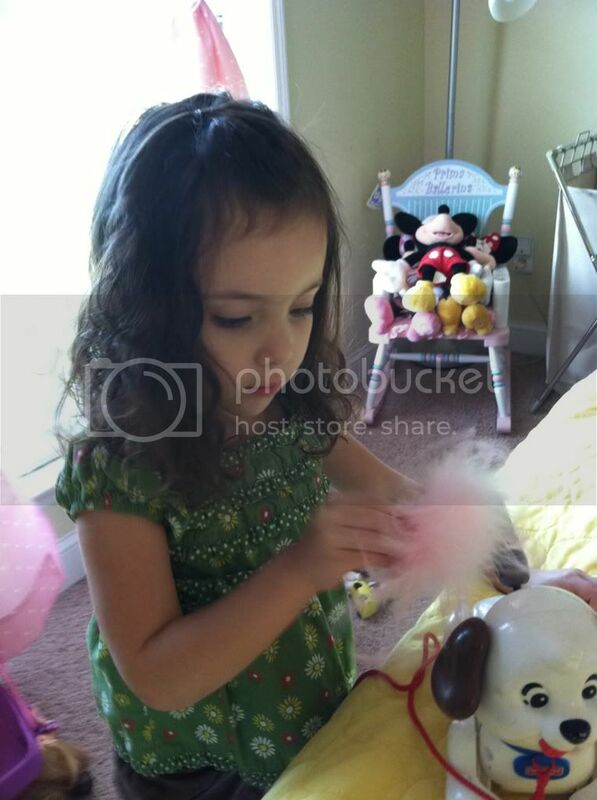 Her hair is extremely curly, so the shorter that it is, the bigger that it is. I also am not one of those people that really loves bangs on little girls. 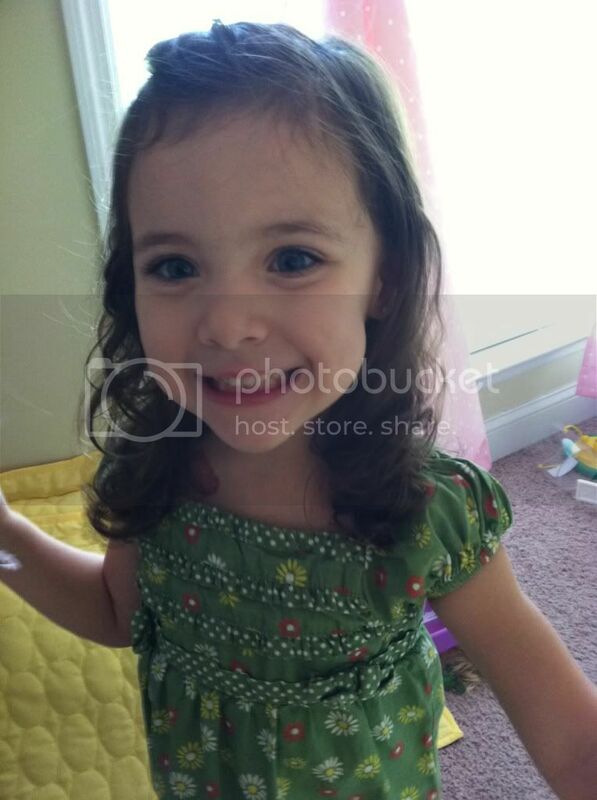 We definitely couldn't cut bangs on her with curly hair, but even if it was straight, we wouldn't have given her bangs. While I absolutely LOVE how long her hair is, I've also been noticing that the ends are pretty damaged. 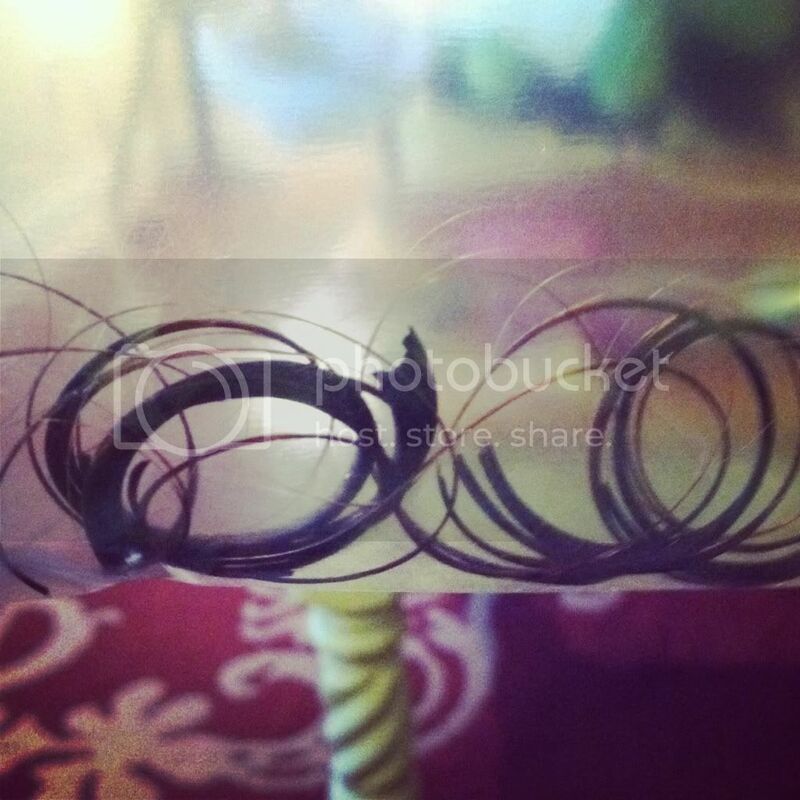 They were dry, brittle, and just frizzy. The rest of her hair still looked beautiful, I just knew that the ends needed some help. This coming August, LL is starting pre-school. I figured that this would be a good "deadline" for us for getting her hair cut. I've been talking to her about it for a good long time, and at first, she seemed like the concept didn't bother her at all. Once the summer came, I really started talking to her more seriously about it. This is when she started to get nervous about it. It got to the point where any time I mentioned it, she would start crying and say that she didn't want her hair cut. Last week, I started talking to her about it a good bit because I knew our time was running out. One night, I asked her about it after she was getting out of the bath. 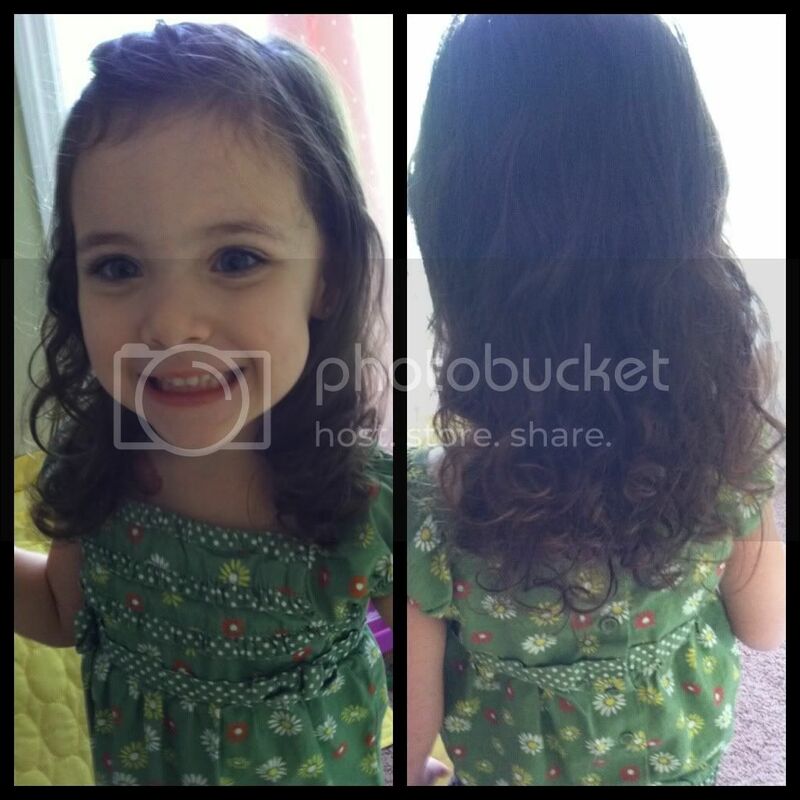 I asked her if she wanted Mommy to cut it, or if she wanted someone else to cut it. She said Mommy, but then started crying about it. I asked her if I could cut it right then. She said no. Then, I told her she could have a sucker. Winner! She immediately said yes. I knew I needed to get it done fast before she changed her mind! She did really good with it! She started getting nervous right before I started cutting, but she let me do it. After I made the first cut she said, "That doesn't hurt - it tickles!" I finished up pretty quickly and showed her what was on the floor. I only ended up taking off about an inch or inch and a half, but it looks SO much better and healthier. The first cut has been made - there's no turning back now! She kept trying to watch me do it - haha. Her first curls! Bagged and ready for her baby book. We're for sure going to continue to let it grow because I really like it long (even longer than it is now). I'm just happy that it's healthier and looks so much better! Really, I have been *so* impressed with LL so far and how well she's handled a new baby coming into our lives. She really is completely in love with Cooper and rarely shows any jealousy issues at all. Don't get me wrong, we have our moments every now and then, but overall she is just as in love with him as we are. During one of Cooper's awake times one morning, I put him in his jungle in his room. LL was so interested in it and wanted to get in, too. Obviously I knew that this was a fantastic picture opportunity and I didn't pass it up! This is her new standard "picture face". Yay. And last, but not least, here's a video of just how great of a big sister she is. When you have an empty cardboard box filled with peanuts!! Isn't this *such* a typical kid thing to do? To love a cardboard box? Matt got something in the mail that contained a bazillion peanuts and a pretty large box. LL got pretty interested in it one night and we both thought - what the heck? Let's just let her go for it! Seriously, it ended up entertaining her for over an HOUR (really rare for her!) and she would have kept playing if we hadn't made her get out so that she could take a bath. Then, of course, Daddy wanted a turn!